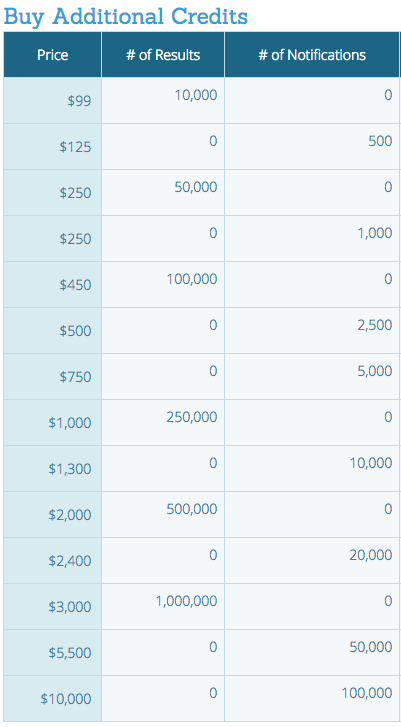 With the release of RunSignUp Results 3.0, we will be introducing new pricing mechanisms. Races who use RunSignUp for registration will still get free results and notifications. The pricing is really meant to address our customers (especially timers who can not dictate registration providers) who use a mix of registration platforms and want to use RunSignUp Results across those races. The pricing is very inexpensive for the number of results posted as well as email notifications. The price is based mostly on the cost of TXT notifications, which are a cost for us to send as well as administer, especially at scale when tens of thousands of txts must be sent on a Saturday morning. This means you can post results for a 2,500 person race to RunSignUp even if you do not use RunSignUp for registration (remember if you use RunSignUp for registration, things are free as discussed below). You could also post results for 10 races of 100 people each. Part of the concept is we want to bring big race features to any race. Note these free credits are tied to a user’s account. This is important to keep in mind since the user account used to upload results must have the credits. For example, a timer would want to have the same account login stored in Race Director or RunScore when doing automated uploads. You can share your credits with other users. This is convenient for timers who have multiple crews and each crew has their own login. You can share with others by entering their email (use the email they are registered on RunSignUp with) at https://runsignup.com/ResultsPricing. We offer very affordable plans for large races and timers based on a flexible “Credits” system. Credits do not expire and can be used across races. You can set your credits to automatically renew if they get used up. Your purchased credits are not used on a race that has RunSignUp registration. For example a timer that has 100 races and 40 of them use RunSignUp and 60 do not. The timer would only have to use the credits on the 60 races, as we automatically detect that a race has enough credits to do results and notifications. The only time this changes would be if the timer expects many more TXT notifications than number of runners in the race. Note the more costly credit packages are really driven by the number of TXT messages since there is a cost to us for those. This credit system allows us to open up Splits notifications. We had previously limited this because we could not afford to give away for free the cost of the TXT messages for 26 splits in a marathon for example. Now the timer or race director can pay for that service beforehand. This updated pricing works well with RunScore and Race Director, the two premier scoring platforms that most timers use. RunScore also uses our technology and RunScore users are encouraged to purchase additional credits needed from the RunScore Results site – https://runscore.runsignup.com/Pricing. It also works with Agee Timing. Since they all support real time updates to RunSignUp Results, delivering notifications in near real time is possible for any size race – even small 100 person races. Our Results platform is also available for license. This means other race industry software and cloud services can “private label” this technology. There will be several partners who will be bringing this to market over the comping months. If your company has an interest in this, please contact us (even if you are another registration site – we are an open platform!). We have seen exponential growth in the use of RunSignUp Results, and the adoption of near real time Notifications. Runners love this “extra”, and we have heard how timers get a kick out of seeing results coming from their chip system into RunScore or The Race Director and a few seconds later the people next to them getting little chirps on their phones to tell the runner their time. Please continue to provide us with feedback so we can continue to improve the system for you, your races and most importantly for your runners.